113min. Directed by Jon Turteltaub. In the film, a deep-sea submersible--part of an international undersea observation program--has been attacked by a massive creature, previously thought to be extinct, and now lies disabled at the bottom of the deepest trench in the Pacific...with its crew trapped inside. With time running out, expert deep sea rescue diver Jonas Taylor (Jason Statham) is recruited by a visionary Chinese oceanographer (Winston Chao), against the wishes of his daughter Suyin (Li Bingbing), to save the crew--and the ocean itself--from this unstoppable threat: a pre-historic 75-foot-long shark known as the Megalodon. What no one could have imagined is that, years before, Taylor had encountered this same terrifying creature. Now, teamed with Suyin, he must confront his fears and risk his own life to save everyone trapped below...bringing him face to face once more with the greatest and largest predator of all time. 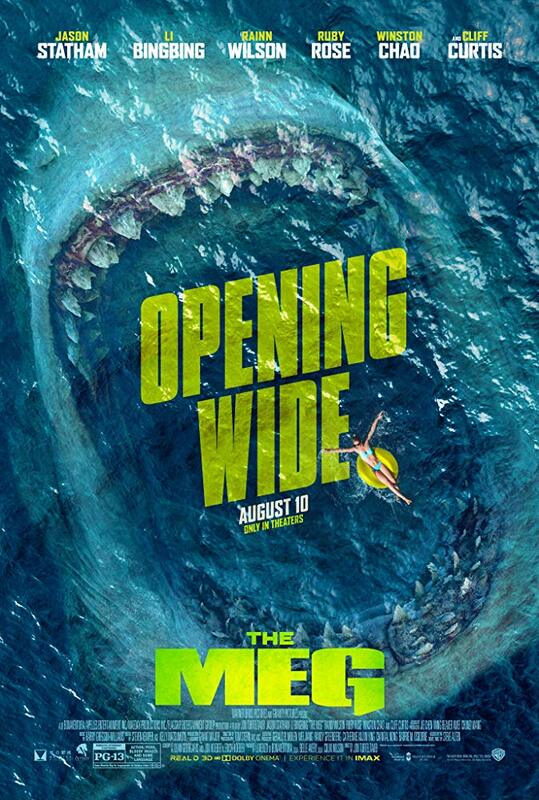 This version of The Meg will be presented in 3D format.